Dr. Todd Engstrom seeks a path around the many sloughs in our way. 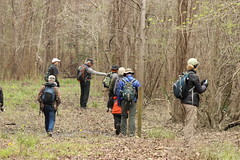 On Day 3 of the Apalachicola River Walk, he was taking us to patches of old growth forest where the extinct ivory billed woodpecker might have made a habitat. While north Florida looks largely “untouched,” much of it has been cut for timber at some point in the last couple of hundred years. There are trees that escaped this fate. They are hundreds of years old and not altogether common. 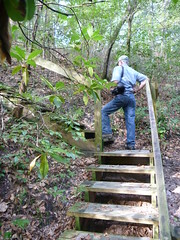 I fell in love with the idea the first time I heard of it, this walk along the land surrounding the Apalachicola River. I was standing on a sandbar just north of Alum Bluff. After a day of kayaking the river, we set up camp and got to socializing. Doug Alderson told me of this thought of his, a hike taking about seven days, from the top of the river to the bottom. You can see how the river changes as you paddle, from tall bluffs in the north on down to the marshy delta. We would be in those systems as opposed to passing by them on the water. What you see in the video above is the first attempt of what could become an annual event in the RiverTrek mold. It was a three day hike through some of the most unique ecosystems in the Apalachicola basin. Torreya State Park and The Nature Conservancy’s Apalachicola Bluffs and Ravines Preserve make you work harder than any other trails in Florida. And Doug & co. didn’t always stick to trails either, bushwhacking through steephead ravines and caves (remember Means Creek from RiverTrek?). We joined them on the third day. Luckily I did have previously unused footage of hikes in the afforementioned lands to illustrate the nature of those places. On the third day, however, we hiked on land owned by the Northwest Florida Water Management District, just across the river from Wewahitchka. It is flat terrain, crisscrossed with those crucially important veins and capillaries of the river- sloughs. I had a great time catching up with my RiverTrek friends (including the scene stealing Zone 5), exploring wild land, and going wherever the high water let us go. The Florida torreya for which the park is named is a critically endangered tree found almost exclusively on the bluffs of the Apalachicola River. The park sports one full camp site with electric and water hookups, restrooms, and a YURT (Year-round Universal Recreational Tent), as well as three primitive camping sites, and two youth camping sites meant for large groups (like Boy Scout troops). The River Walkers were staying at one of the Youth sites. There are also two trail loops, one of which takes you by the Gregory House. The Gregory House is a fully furnished plantation home built in 1849 and which was moved onto a bluff overlooking the river (If the water is low enough, there is a sandbar across the river where paddlers can eat lunch and have a view of the house as well). Much of the Bluffs and Ravines Preserve is not open to the public, being instead dedicated to restoration efforts: restoring sandhill habitat, managing a fire regime on upland pine forests, and restoring the flow of streams into the river channel. The Preserve is also home to a unique ecosystem, the steephead ravine, which forms over years when seeps of water cut into sand or clay hills. Steepheads are, as the name suggests, steep (I know, I was surprised too! ), and make for some challenging hiking. The Preserve’s Garden of Eden trail runs through steepheads on the way to Alum Bluff, the highest point above the river and a spectacular view. You can watch us hike the Garden of Eden at the beginning of our RiverTrek 2013 Part 1 video. 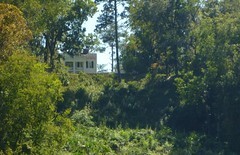 You can also watch us climb Alum Bluff the hard way on RiverTrek 2012. This is not a place you would ever find if you weren’t specifically looking for it. In fact, if you click on the link above they don’t even really tell you where to find their land on the river. Traveling south of Bristol on C379, if you keep your eyes peeled, you’ll see signs for Forest Road 188 and for a boat ramp. This is the ramp for the Florida River, and where you’ll find the trails we explored in the video above. The spent shell casings testify to someone knowing that this place was there, and also serve as a reminder to wear bright colors if you visit here during hunting seasons. This is Florida’s largest National Forest, ranging from just near Tallahassee to the Apalachicola River. That’s a lot of protected land that buffers six different watersheds. 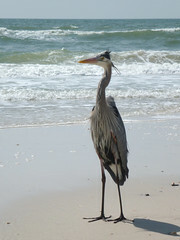 Right near the Apalachicola, a big attraction is wildlife watching. This part of the forest is a stronghold for the near threatened red cockaded woodpecker. As you drive down County Road 65, you’ll see trees with white bands painted around their trunks. Those trees may have holes that drip sap- this deters snakes from climbing up. As the sun sets, the RCW flies back into its hole. Also near the river is Sumatra, where in late spring an incredible array of carnivorous plants will bloom. Where E.E. Callaway found the Garden of Eden on the bluffs of the north river, Cebe Tate found hell in this forest to the south. I’ll refer you to our EcoAdventure on the lower river to get the full story. The Tate’s Hell Swamp drains into the Apalachicola River and Bay, and the forest also includes 35 miles of paddle trails, including Cash Creek and Graham Creek (which you’ll see in the linked video). There is also camping and hunting in the forest; refer to the link above for information on fees and permits. The Florida Fish and Wildlife Conservation Commission manages much of the land on the lower river, where creeks and tributary rivers braid the main channel. FWC has maps available for paddlers looking to explore the many waterways on the WEA and in Tate’s Hell. 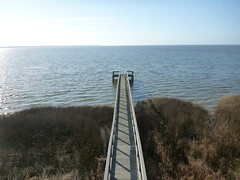 The Sand Beach observation tower provides a nice view of the East Bay and the many birds and other critters that make use of it. You can get a taste of the recreational opportunities on the WEA on our aforementioned south river EcoAdventure. And of course, once you’ve made your way down the river, you can keep following the water and enjoy some camping, hiking, and beach time on one of the barrier islands that close the bay and protect the oysters from the side opposite the river. Over the last couple of years, we’ve explored this watershed from the top of Alum Bluff to the bottom of Apalachicola Bay. And we’re nowhere near done, either. But the WFSU viewing area is rich in ecological marvels. 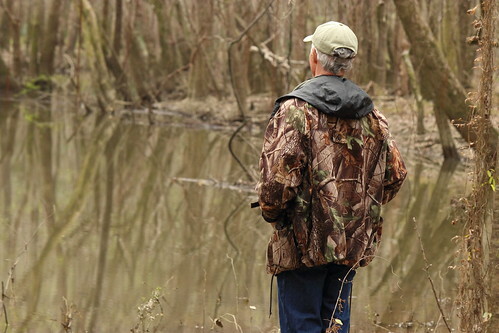 An upcoming focus of ours will be the many watersheds that span from the Big Bend to Choctawhatchee Bay. I’d like to further highlight the connections between the many terrestrial and freshwater features of our areas and our coasts. And that includes urban settings like Tallahassee, whose lakes and sloughs feed both the Ochlockonee and St. Marks Watersheds. In some cases, we’ve already covered a few links in the chain through EcoAdventures and In the Grass, On the Reef research pieces. Now it’s time to fill in the gaps and start looking at the bigger picture, as we’ve been doing on the Apalachicola. 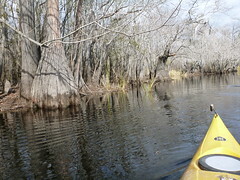 Interested in paddling the Apalachicola? Check out this post I wrote a few months ago on planning a trip using the Apalachicola Blueway Guide. Music in the piece by Freeky Cleen and Dickey F.